Thousands of British aviation jobs are to be safeguarded over the next 15 years by a £20bn contract from the US Air Force, Airbus owner EADS has said. European group EADS and the US's Northrop Grumman are to build a fleet of 179 in-flight refuelling aircraft. The wings and other components will be made at factories in Filton, near Bristol, and Broughton in Flintshire. EADS says 13,000 people are employed at its plants, whose work also supports tens of thousands of other UK jobs. Business Secretary John Hutton said: "This is a welcome vote of confidence in Britain's highly competitive aerospace industry and is recognition of the world-class skills and commitment shown by our aerospace workers." But he told BBC News 24 that a programme of job cuts at the Filton plant announced last year would still go ahead. Up to 1,600 posts are expected to be lost across the UK by 2011. Howard Wheeldon, a defence industry analyst with BGC Partners, said the contract was the largest single order ever placed by a US buyer for a European product. "It is a momentous award for EADS," he said. He said that the deal was for four test aircraft initially, worth about £1bn, which if supplied successfully would lead to work on the rest of the order. And after the first phase of building 179 of the planes, which are based on the winning KC-30 design and will be called the KC-45A, there could be demand for hundreds more, says the BBC's Andy Moore. Robin Southwell, chief executive of EADS UK, said the contract "gives the transatlantic alliance a significant industrial boost and will secure British jobs - at Airbus in Filton and Broughton - for many years to come". The Society of British Aerospace Companies' Matthew Knowles said: "This is an extraordinary success by the companies involved and a demonstration of the success of the UK aerospace and defence industry in contributing further billions into the British economy." But US manufacturer Boeing, which had been favourite to win the contract, is expected to appeal against the decision. "It will be a long and difficult process of challenge, and we cannot guarantee yet that this is on board," said Mr Wheeldon. The award announcement drew condemnation in the US from congressman for Kansas and Washington, states with large Boeing plants. 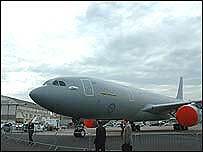 But a US Air Force spokesman said the winning design, based on the Airbus A330, had many advantages over Boeing's tanker. "More passengers, more cargo, more fuel to offload, more patients that we can carry, more availability, more flexibility and more dependability," said Gen Arthur J Lichte. Northrop Grumman will assemble the planes at a site in Alabama. UK workers' contribution to the order amounts to about 20% of the aircraft. Bernie Hamilton, national officer with the Unite union, said it was "very good news" for the workforce at the Broughton wings plant and Filton. "It's a very good contract, we were up against very stiff competition. You have to take into context this is from the US defence sector, and there was competition from an American competitor and an American product." Mr Hamilton said Airbus had an "excellent reputation" and a "world-beating product" but he also praised the "joined-up thinking" of the UK government for its role "in shouting up for the Airbus product". He added: "I'm sure there will be lobbying taking place to rethink and look at this contract again but the fact this is their preferred decision will go a long way."